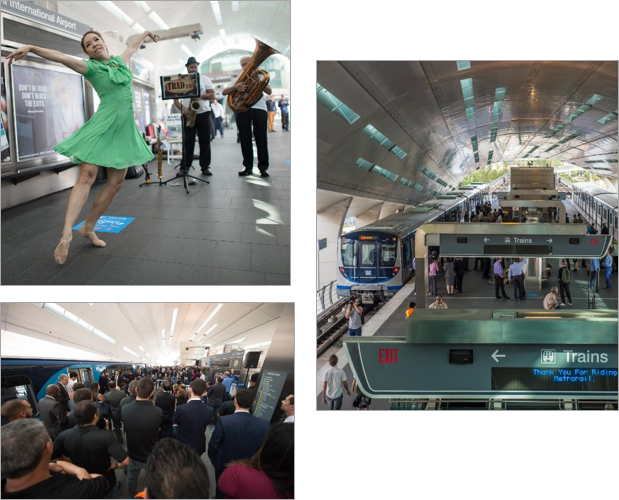 Over 200 guests commemorated the inaugural ride of Miami-Dade County’s first new Metrorail train in 33 years. The special event took place at the Airport Metrorail Station. With SnapChat geofilters, local musicans & dancers, the event was a huge success. 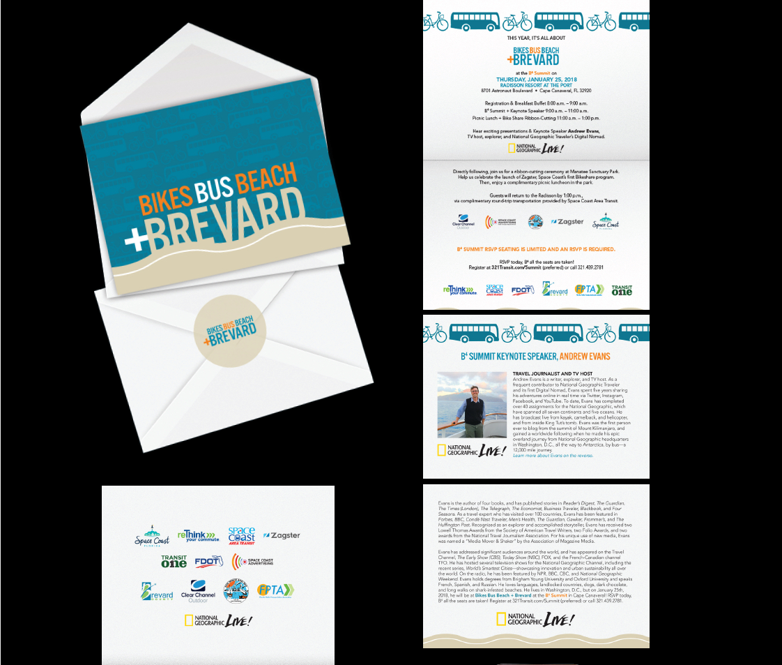 Over 180 elected officials and community stakeholders attended the sold out B4 Summit: Bikes Beach Bus and Brevard. The Summit outlined tourism-transit partnerships; unveiled bike safety initiatives; and initiated new transit funding. The keynote speaker was National Geographic Travel Journalist and TV host of "World's Smartest Cities", Andrew Evans, who gained a world-wide following when he made an epic overland journey from Washington D.C., to Antarctica, over 12,000 miles, by bus. 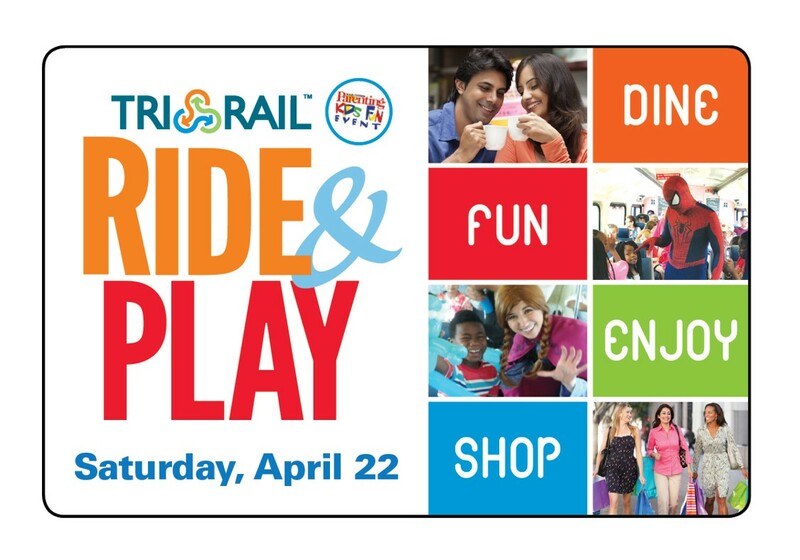 Tri-Rail’s “Ride & Play” day offered South Florida the opportunity to experience the train while riding to South Florida’s best attractions. Riders enjoyed onboard fun on select trains with costumed characters, balloon artists, magicians, giveaways and meet-and-greets with top radio personalities. Also, riders received exclusive offers from popular attractions. Throughout January 2017, New Year New App pop-up marketing events were held at bus stops to promote a free ride day for employees and other riders in tourism and transit corridors who downloaded the "321Transit" App. On January 27th, over 3,200 participants received free bus rides for downloading the new App on their mobile device. Bay Town Trolley wanted to raise awareness for their new service to the local VA Outpatient Clinic and their commitment to serving veterans. 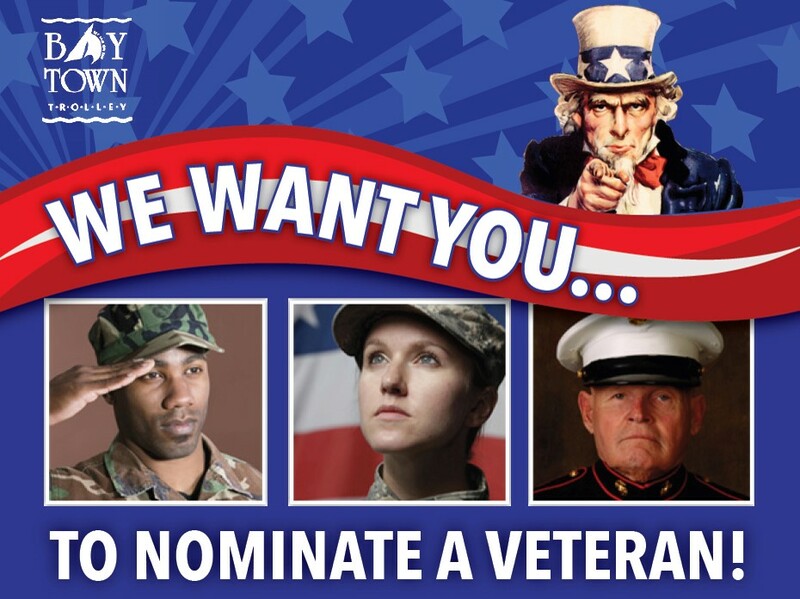 The system asked the community to nominate local veterans who deserved to win an annual bus pass. The campaign received dozens of entries and garnered over 22 million media impressions. 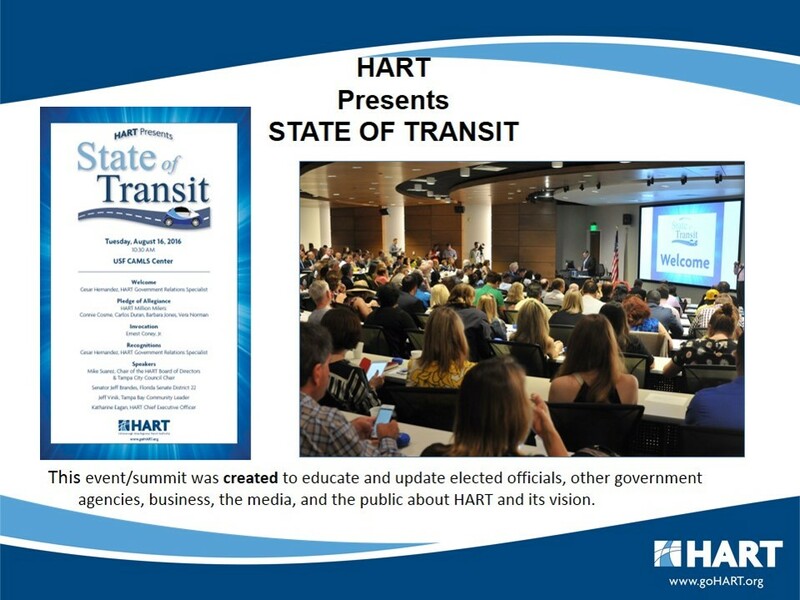 HART created and event/summit to educate and update elected officials, other government agencies, business, the media and the public about HART and its vision. 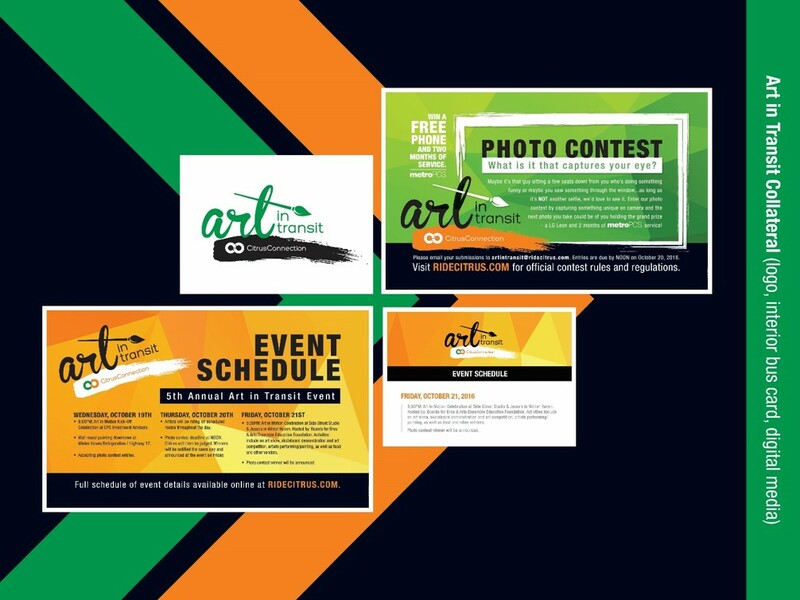 Art in Transit, the annual Citrus Connection effort to bring public transportation and the arts together, featured visual and performance artist on transit buses and terminals throughout Polk County. Themed Art in Motion, Citrus Connection partnered with Arts Ensemble International to mesh Polk County’s extensive art world with public transportation. 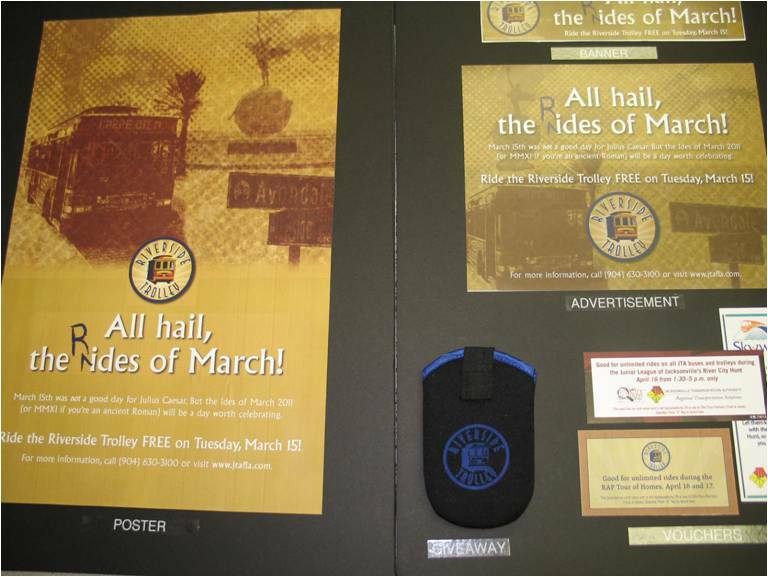 Bay Town Trolley was celebrating the system’s 20th anniversary by hosting a series of rider surprises throughout the year. The system conducted its first surprise on National Dump the Pump day by offering free rides and surprise live music on the bus. The special event garnered over 1 million earned media impressions. 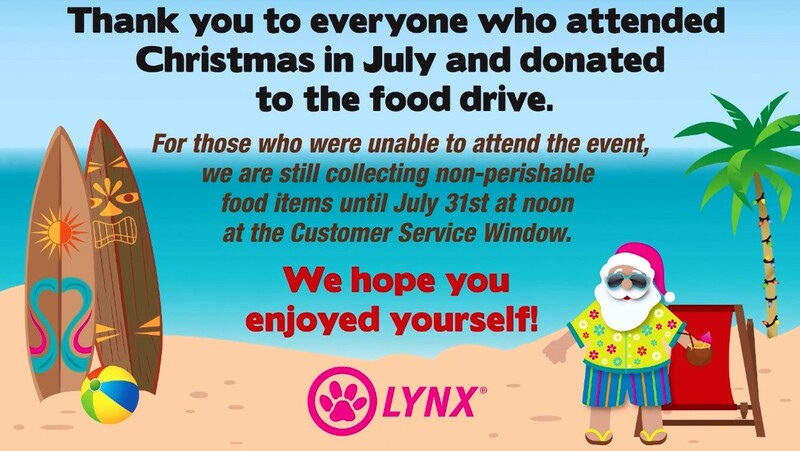 LYNX hosted an event inviting customers and the community to celebrate Christmas in July and donate 3 non-perishable items in exchange for an All-Day bus pass. Guests enjoyed live music, food trucks and photos with Santa. The agency collected 1,000+ pounds of food for Second Harvest Food Bank of Central Florida. 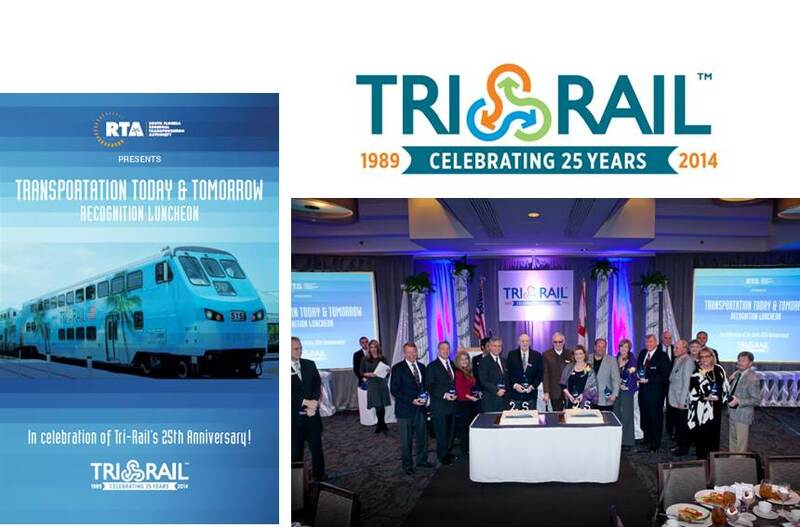 Tri-Rail’s “25th Anniversary Luncheon” welcomed more than 300 community leaders, elected officials and transportation supporters, to celebrate the agency’s milestone, highlighting Tri-Rail’s successes with a retrospective video, local talent performances, celebrity TV host, trumpeter cake presentation and remarks by Therese McMillan, FTA Deputy Administrator. The event generated more than $40,000 in sponsorship revenue. “Resolve to ReThink Your Commute Day” was a co-promotion with FDOT’s District 5 Commuter Assistance Program “ReThink”, and Brevard Workforce. In addition to challenging the community to ReThink the way they got to work, a new route serving Brevard Workforce was unveiled. 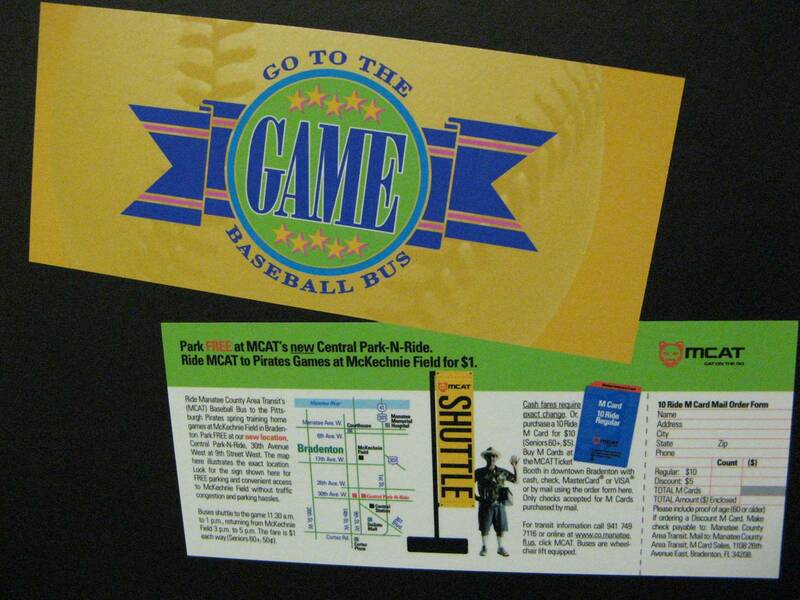 Free ride coupons were distributed and mini trade show booths were set up at key bus stops. During the kick off ceremony, Space Coast Area Transit was the first transit agency in the state to be awarded a “Best Work Places For Commuters” designation by CUTR. Over 6,600 residents participated. 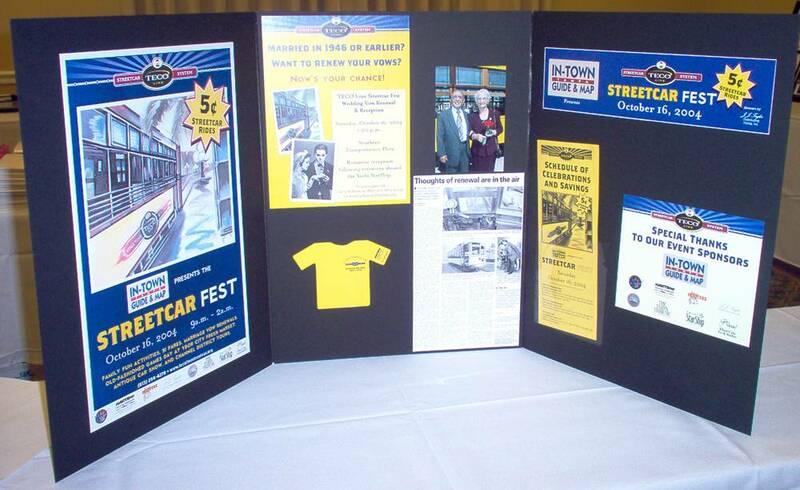 The 10th Anniversary of the TECO Line Streetcar System was celebrated on October 19, 2012. Festivities around the entire line (11 stations stops) that day included: 10¢ Streetcar Rides from 10AM to 2AM; a special promotion with headline act, Cirque du’ Soleil (new Kooza Show); live music center stage in Centro Ybor (Historic District); a magician; animal encounters provided by the Lowry Park Zoo; discount savings brochure of shops, retailers and businesses along the line; balloons, birthday cake and much more. More than 200 people, including our proud Veterans community, helped celebrate the launch and ribbon cutting of Polk Transit’s $1.5 million Regional Mobility Call Center on June 17, 2013. The Call Center, one of the first in the nation, provides mobility options for local veteran, elderly and disabled residents of Polk County. This project consolidates the three public transit agencies into the Polk Transit Authority one call/one click center providing a seamless system of customer service to our veteran’s population and all Polk County residents. 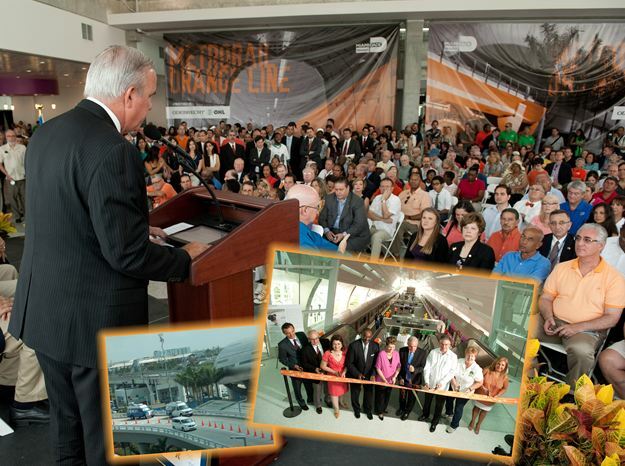 Target Audience: All of Miami-Dade County Project Cost: $714.42 Description: The July 28, 2012 inauguration of the new Miami International Airport Metrorail Station and Orange Line service was a historic event in South Florida. Beginning in March, MDT coordinated contributions from multiple public and private organizations to stage a memorable showcase for 250-300 “VIP” attendees. The results exceeded all expectations: nearly 500 people attended including local members of the U.S. Congress and the Florida House of Representatives, as well as the County Mayor and Commissioners, and was heavily covered by local TV, radio and newspaper outlets. Target Audience: Purple Heart recipients and transit riders Project Cost: $3000 Description: Polk County Transit Services joined forces with Polk County Veteran Services to honor the more than 3,000 Purple Heart Veterans who call Polk County home with a special ceremony for the unveiling of our Purple Heart Veterans bus. The unveiling was held in conjunction with the groundbreaking for a much deserved Purple Heart Veterans Monument. As the crowd of 200 people gathered at Memorial Park in Lakeland, 25 proud Purple Heart Veterans boarded the newly wrapped Purple Heart Bus roughly a half mile away. Many of the veterans featured on the side of the bus were now passengers ready to be part of the unveiling. The bus rolled into the event to be seen for the first time. As it turned the corner, attendees stood in anticipation to get a better view of this rolling tribute. When the doors opened, the Purple Heart veterans stepped off and were individually introduced to the standing and cheering crowd. Some with tears in their eyes, these veterans were greeted by dignitaries and escorted to reserve seating. From World War II to the War in the Middle East, these veterans are honored with a mobile tribute that served as the background for the one-hour event where state and local veterans officials spoke of the significance of the sacrifices our veterans made and how that bus will serve as a reminder of those sacrifices to all generations of Polk County residents. The event was the pinnacle of a week’s worth of events including the county’s designation as an official Purple Heart County. PCTS incorporated that proud distinction into the bus wrap design that proudly states: “Polk…. 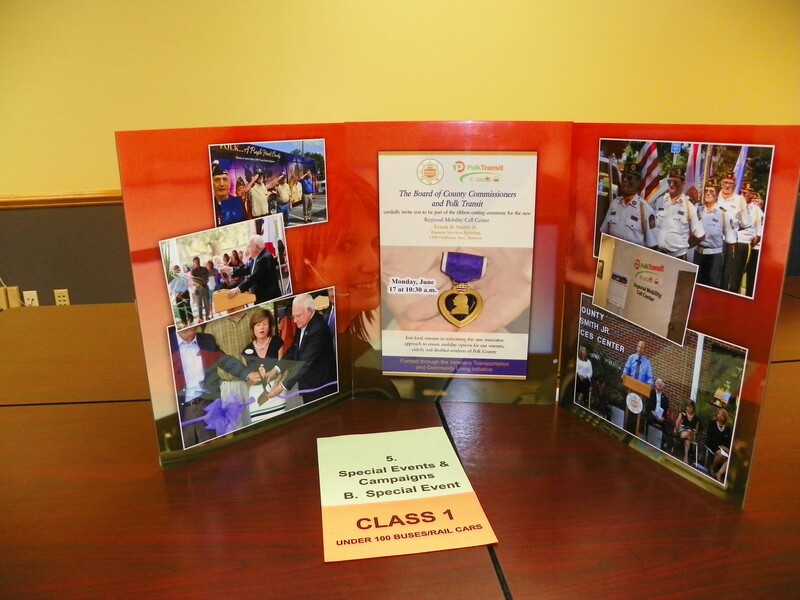 A Purple Heart County.” While the bus was the centerpiece of the event, the Purple Heart Veterans were the true guests of honor. 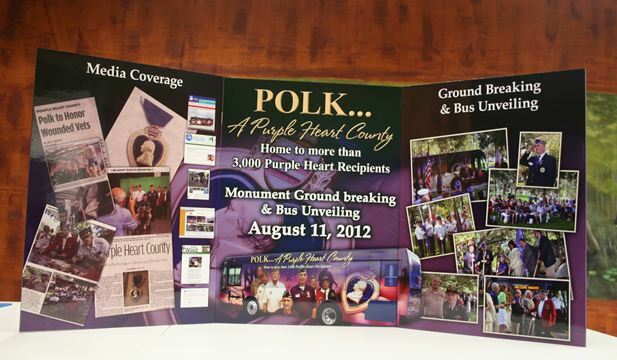 A large display board, featuring a photo of the bus, was signed by all of the Purple Heart Veterans. The board was later presented to the Polk County BOCC as a thank you for their support of the project. The media buy-in from newspapers, TV, and online media was nearly 10 times more than the cost of the event including the bus wrap. Target Audience: Individuals living and working in Riverside Project Cost: $2,500 Description: JTA’s Riverside Trolley ridership for the first two weeks leading up to Rides of March event steadily increased an average of 3% each week, about 125 riders. Results for the actual free ride day showed a full day increase of 14% with off-peak showing an increase of 8%. 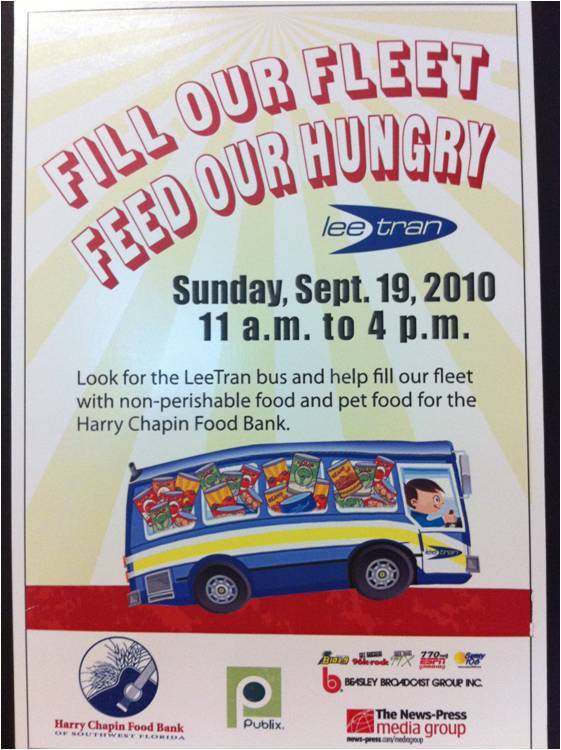 Target Audience: Lee County Residents Project Cost: $1100 Description: LeeTran held a county-wide food drive in partnership with Publix supermarkets to benefit the Harry Chapin Food Bank of SW FL. A vehicle was parked at all 33 Publix stores in the county, and volunteers “stuffed the buses” with donations, dropping them at the food bank at the end of the day. The drive collected 72,273 pounds of food and more than $3000. It received coverage by the local daily newspaper and three television stations, and had extensive radio promotion through a sponsorship by a group of five stations. 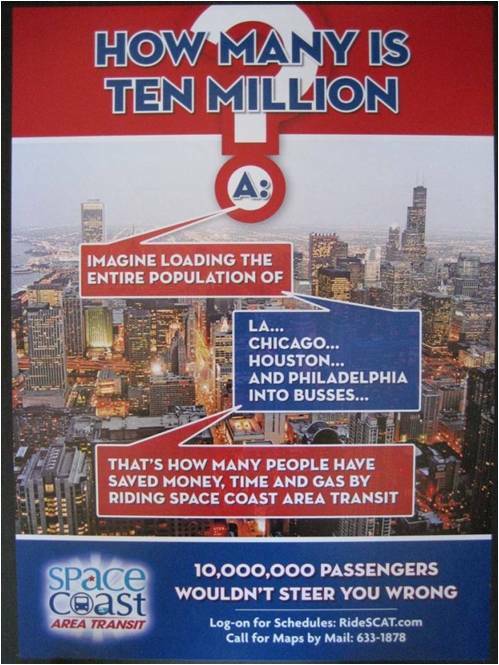 Target Audience: Riders/potential riders Project Cost: $3,335 Description: The 30-day ten millionth rider promotion was a huge success for Space Coast Area Transit. During the month of April when the promotion occurred, ridership increased by 17.82% over the year prior. According to Google Analytics, of the 5,704 unique visits to the website that month, 63.74% were new visits. Both statistics indicate that we were successful in attracting new riders as a result of this promotion. Over $5,000 in prizes and $34,000 in print and broadcast media was donated by our marketing partners. During the first two weeks, Florida Today Newspaper published a feature story about the promotion on the front page of the local section and also did a follow-up story the day the ten-millionth rider was honored. NEWS-13 featured the surprised passenger on the local news. After awarding the millionth passenger, the second 2 weeks focused on how many 10 million really is! 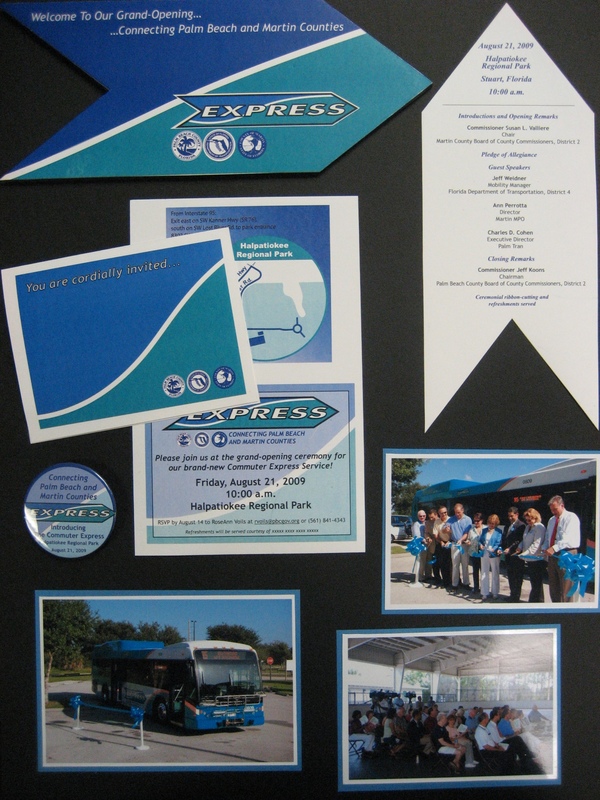 Target Audience: Residents of Palm Beach & Martin Counties, News media Project Cost: $500 for invitations, programs & refreshments Description: In 2007, officials from FDOT approached Palm Tran with an idea to operate express bus service originating from Martin County. Representatives from Martin County, South Florida Commuter Services and FDOT worked with Palm Tran. In celebration of two years of hard work, a grand-opening event was held. The news coverage generated before and after the event assisted with creating interest in the new service. The event was attended by local elected and transportation officials, the media, and interested members of the public. This project has provided many first-time experiences for Palm Tran: - The first limited-stop express park-and-ride service. - The first bus with Wi-Fi internet access. - The first route to be operated across county lines. - The first introduction of hybrid buses to the fleet. 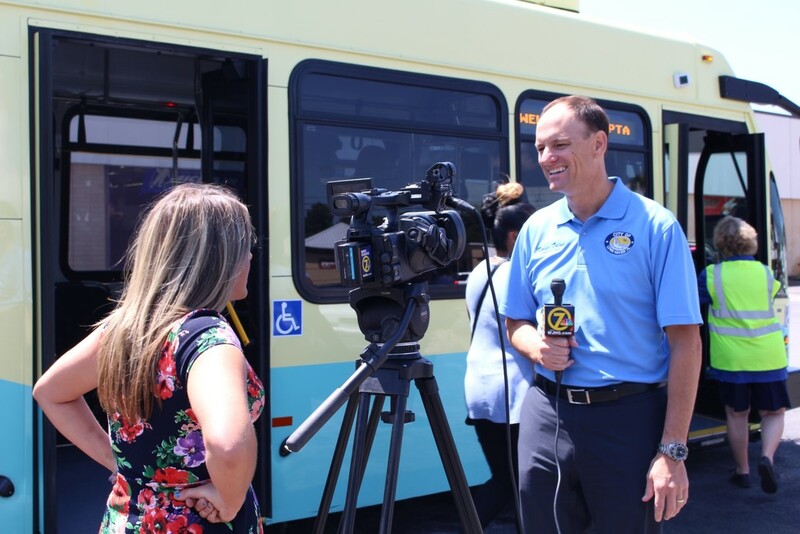 The Commuter Express has given Palm Tran the opportunity to expand its demographic base, to enhance and build the image of public transportation in the community and to establish better relations with neighboring Counties to the North. The implementation of the Commuter Express was truly a cause for celebration. Target Audience: Existing Riders, potential riders, local officials and transit advocates Project Cost: Sponsorship donations $2800, own expense $425. 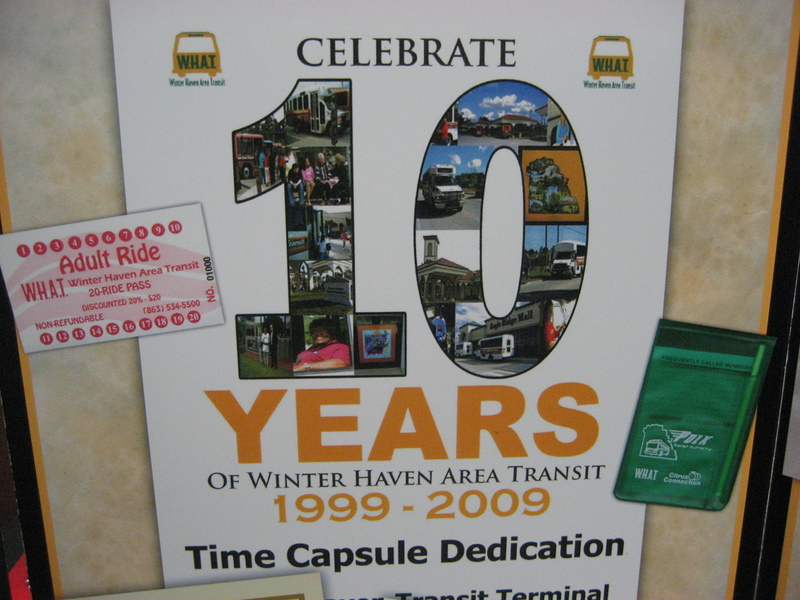 Total – $3225 Description: The Winter Haven Transit 10th Anniversary celebration and time capsule dedication. 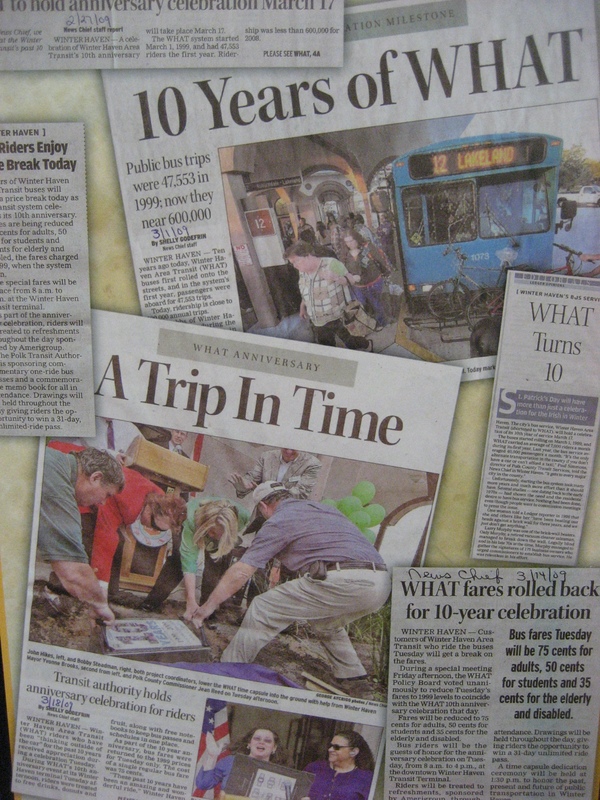 - Nearly 1,000 attendees - Newspaper coverage included previews and event coverage equal to nearly $2500 in free advertising - Over 800 bus passes were distributed throughout the day with over 90% return - Community leaders and riders came together to provide transit memorabilia for the time capsule (to be opened in 2034) - Sponsors provided $2800 worth of valuable in-kind donations (food, beverages, signage, giveaways, and supplies) - Recognition from the US House of Representatives - All invitations were done through signage at the Terminal, on buses, and through email. No postage expense incurred. - Printing of programs and flyers was done in-house - The visible success of the event will be vital in our efforts toward securing a dedicated funding source for Public Transportation in Polk County - Granite time capsule maker was donated by staff member and lettered at no charge to sponsor. Target Audience: Community and business leaders Project Cost: $2,900 (buses painted in-house) Description: LYNX created quite a buzz for public transportation when the agency announced that it had received a grant from the state of Florida to operate its own bio-diesel fuel refining operation. To take advantage of the positive publicity, LYNX staged a signing ceremony that included Florida Governor Charlie Crist. Prior to the event, LYNX sent an invitation via email (the environmentally friendly way) to community and business leaders. 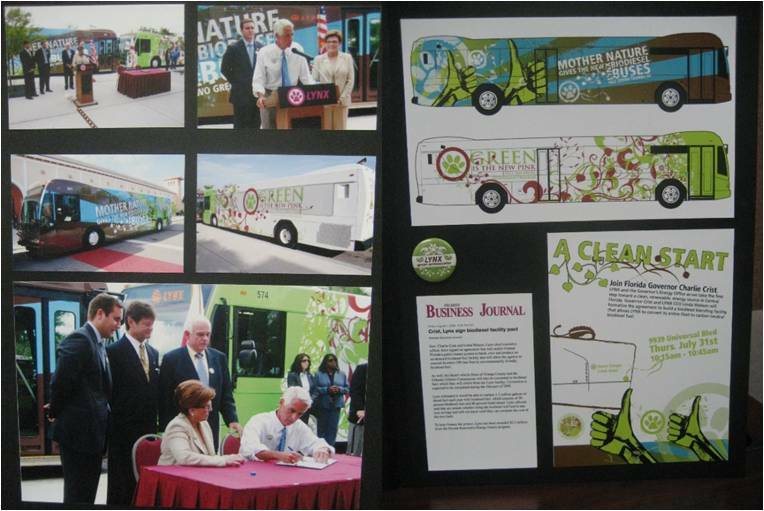 LYNX brought two buses to the ceremony, each painted with an environmental setting, to emphasize the agency’s desire to go green. 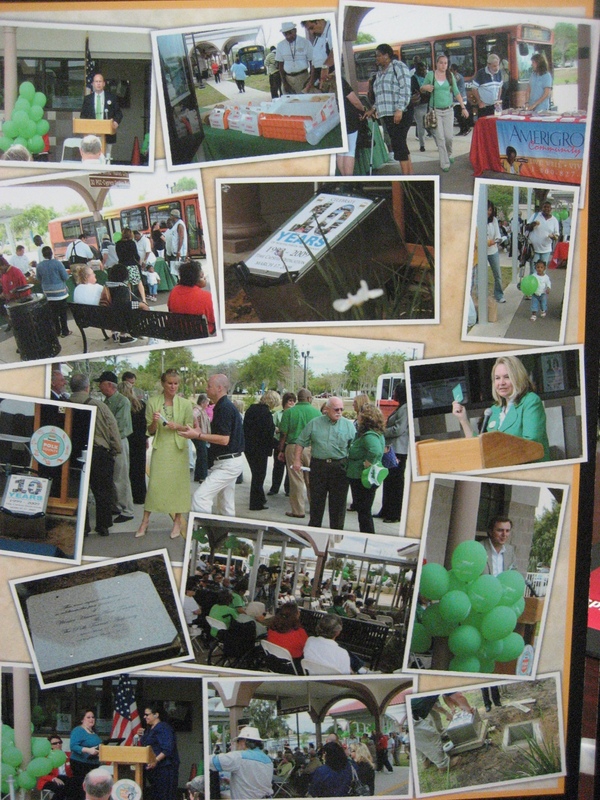 LYNX representatives wore “Green Ambassador” buttons with the same background setting as the painted buses. The coup de gras, however was getting Governor Crist to the ceremony. He was booked to be the keynote speaker for the Florida Farm to Fuel summit that day, and took time out to join LYNX CEO Linda Watson and sign the official agreement between LYNX and the state of Florida. The event was covered by all 7 of Orlando’s TV stations and there were at least 10 news articles written about the event – meaning we were able to reach beyond our target audience to the public at large. Target Audience: Riders, future riders, BoCC, civic leaders, employers, media Project Cost: $2,112 Description: Themed invitations, artwork unveilings, inspired speakers talking about transit and art, a local high school orchestra and specialty-printed souvenir ribbon were used to generate the large attendance (380) needed to deliver our educational message about the value of transit in Polk County. Attendees were not spectators, they were participants. Based on the 12 permanent tile art pieces incorporated into the construction of the terminal, “The Art of Transit” theme was used as the focal point. 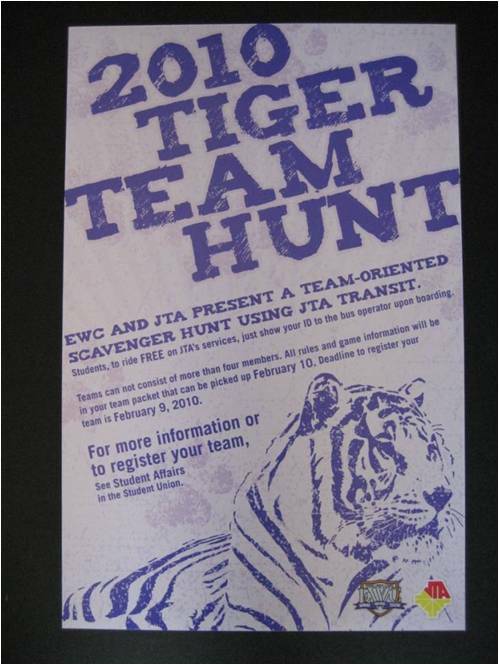 The ribbon was custom printed with the “Art of Transit” stamped repetitively on it so that participants could take a piece home with them to commemorate their participation. When the media advisories and press releases went out, the press ate it up, providing great front-page coverage of the interactive ribbon cutting. Front page preview coverage ran a week prior to the event, the day of the event, and the day after the event. 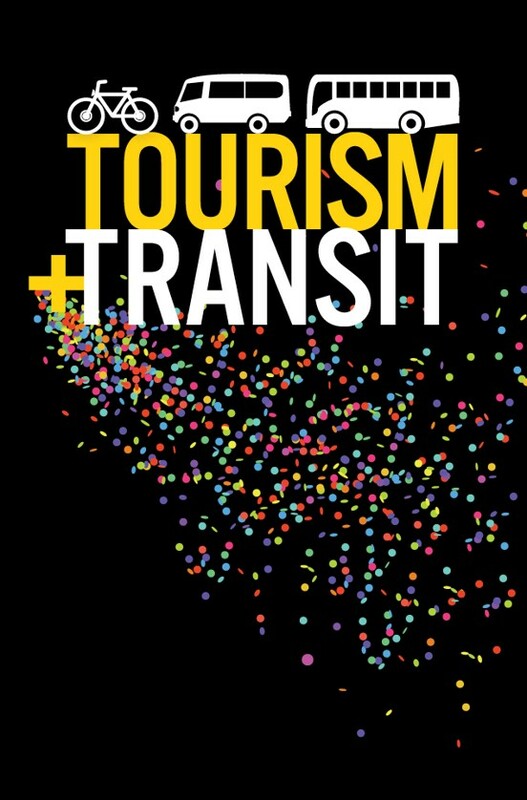 Our public awareness goal of 80 percent of attendees was reached when event surveys recorded that 93.1 percent of attendees said the event “enhanced their understanding of transit opportunities available in Polk County. Ridership figures were a strong barometer showing that during the two months after the time the ribbon was cut (Dec 6, 2007 to Jan 31, 2008), ridership increased 7.5 percent (6,465 more riders) over the same time frame a year ago. This is 3.5 percent higher than our goal of 4 percent. The print media (both major local papers) printed FIVE positive front page stories (7 color photos) including a video montage. 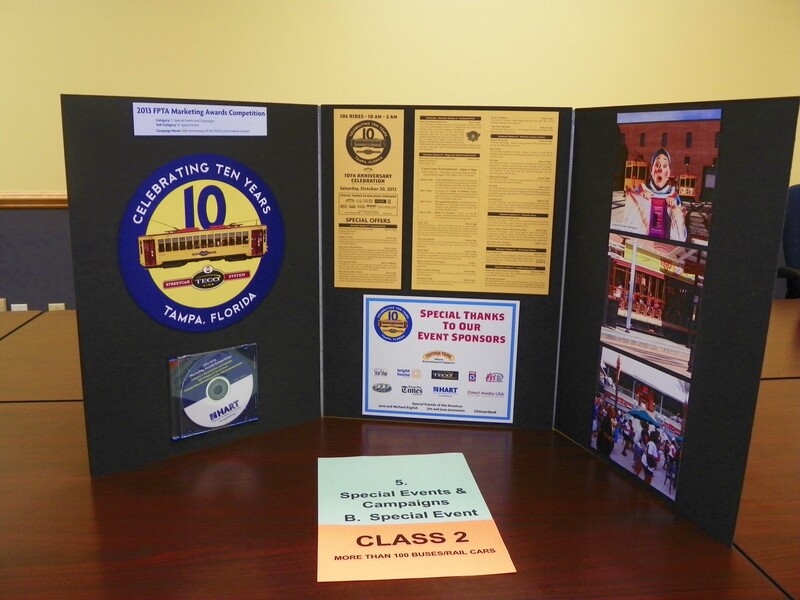 Target Audience: Residents-Visitors of Hillsborough & neighboring counties Project Cost: $15,000 Description: This was the 4th annual Fest held on the TECO Line Streetcar System, a heritage rail line that connects downtown Tampa with historic Ybor City. This annual event is held to enhance the awareness of the system, offer an incentive for the community to visit the line and ride, and to contribute to area economic growth. The fare this day was $.05, more than 10,000 attended and the event commanded tremendous media coverage. Ridership the day of the Streetcar Fest exceeded 10,650 trips, an all-time record high for the system, and a significant increase over the average Saturday ridership of 3,000. 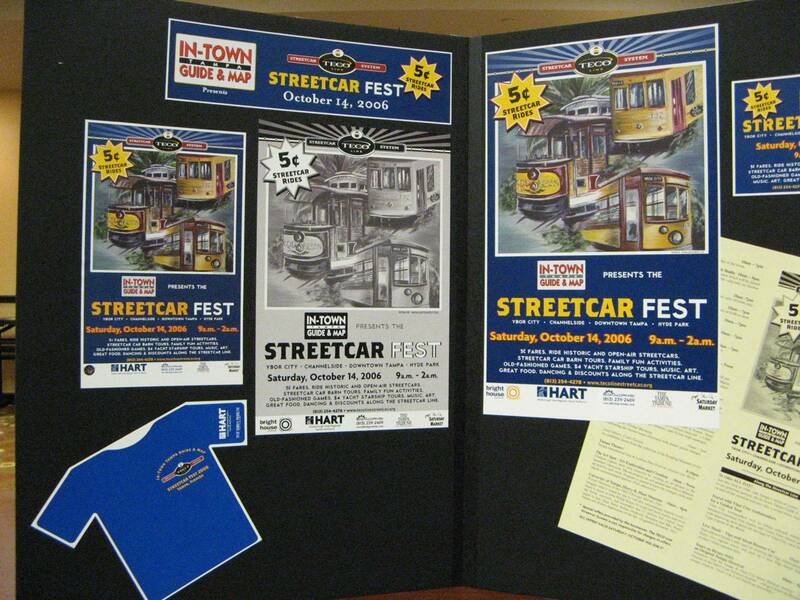 The Streetcar Fest was truly a grassroots initiative, with 60% of the event budget coming from in-kind contributions. Target Audience: Riders, future riders, federal, state, and local officials Project Cost: $5,633 Description: Elements of the campaign included flyers mailed to season ticket holders, flyers distributed at the Pittsburgh Pirates ticket window, ads on the back of the tickets, an ad in the Pirates pocket schedule, a full-page, four-color ad in the season program, PA announcements at each game, inclusion in the Pirates newspaper ads. Effectiveness: In it’s third year, the Baseball Bus ridership increased 35% over the previous year despite that the parking location changed from one site to another between 2006 and 2007, requiring a massive re-education of the target audience to prevent loss of customers due to the parking location change. 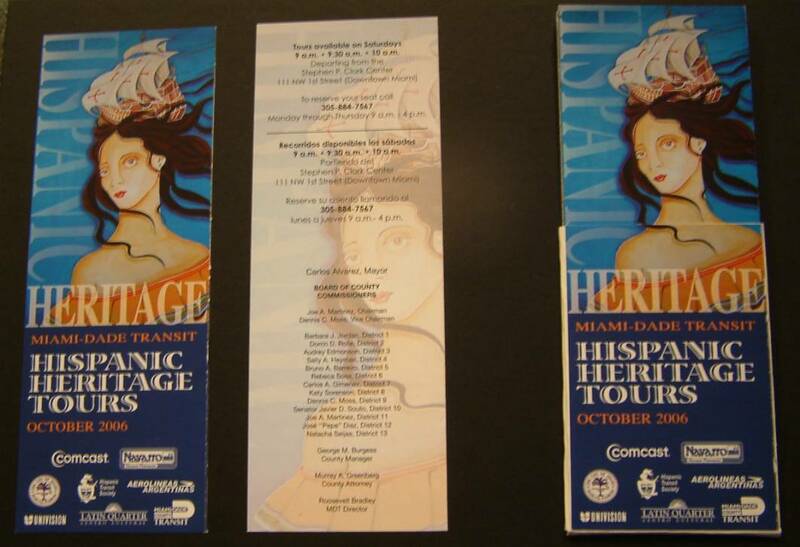 Target Audience: Residents and visitors in Miami-Dade County Project Cost: $30,000 (plus $10,250 in sponsorship donations) Description: Each Saturday, during Hispanic Heritage month in October, Miami-Dade Transit offers a unique view of the area’s rich Hispanic history through the tours, which are free for the public. Already, more than 500 residents and tourists have registered to enjoy the tours on board full-size, comfortable buses that depart from downtown Miami. The tours, which are narrated in English and Spanish, travel to the streets, the buildings, and monuments that stand as symbols of Miami-Dade’s Hispanic past. In its sixth year of the tours, MDT has teamed up with prominent Miami historian, Dr. Paul George, to bring the community more in-depth narratives and additional historic sites. Included in the tours stops this year are neighborhoods in Wynwood, Allapattah, Little Havana, Downtown Miami and the Orange Bowl area. Further, the tours’ promotional materials feature a one-of-a-kind painting created by local artist Rámon Unzueta. The tours’ last stop will be a street fair at the Latin Quarter in Little Havana. Target Audience: Riders, future riders, federal, state, and local officials Project Cost: $750 Description: $750 doesn’t go very far these days, but in Polk County, we used it to generate record setting attendance, increased ridership and extensive news coverage. 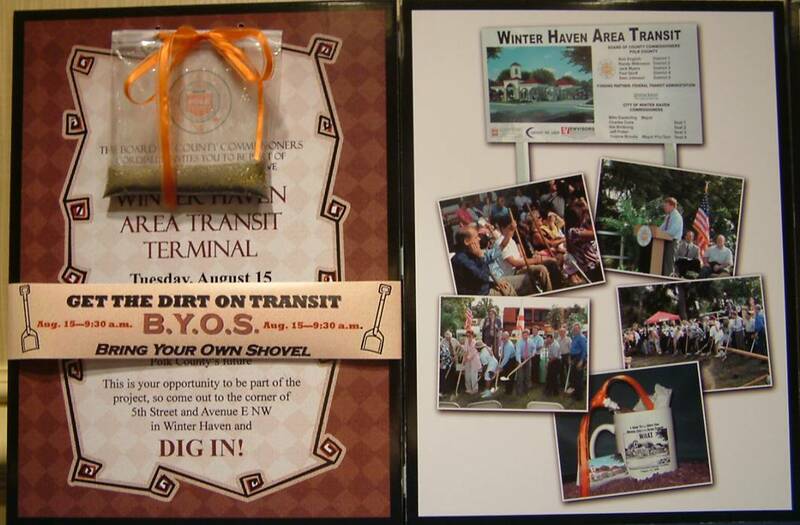 The “Get the Dirt on Transit” groundbreaking for the $3.1 million Winter Haven Area Transit terminal featured 200 riders and dignitaries breaking ground together. Since the event, ridership jumped 14 percent on the routes that would use the terminal. The event earned extensive coverage in three daily newspapers, several weeklies and radio news with an advertising value of over $2,200. Target Audience: General Community, Potential Riders Project Cost: $9700 Description: This was the third annual fest held since the grand opening of the TECO Line Streetcar System, a hertiage rail line that connects downtown Tampa with historic Ybor City. This annual event was held to enhance awareness of the system, offer an incentive for the community to visit the line and ride, and to contribute to area economic growth. 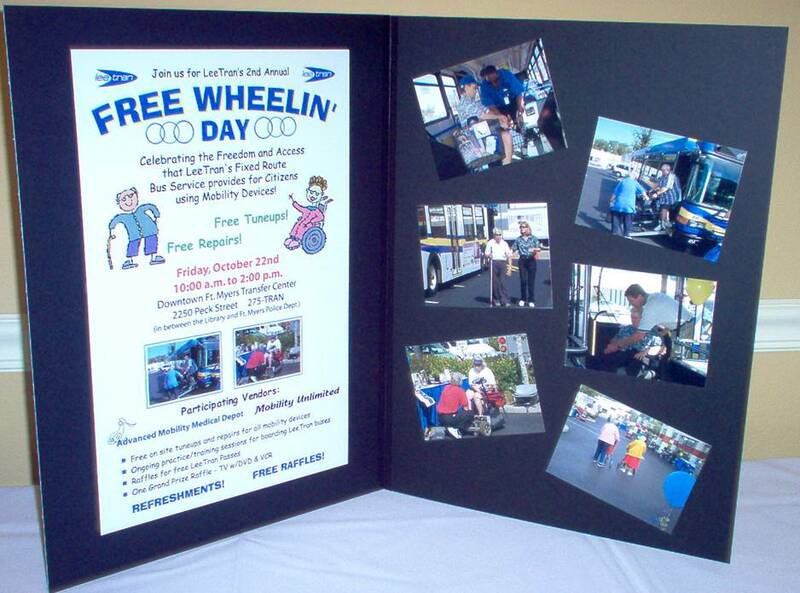 Target Audience: Mobility Impaired residents, all ages Project Cost: $550 Description: Free Wheelin’ Day is an outreach program to familiarize those with disabilities with LeeTran’s fixed route service. In 2004, it attracted approximately 50 residents who had the opportunity to practice boarding our wheelchair-accessible vehicles.